The school run accounts for at least one in every five cars on London’s roads, and is a major cause of congestion, pollution & frustration for road users. And its a major contributor to road danger – many parents say they drive their kids to school because its too dangerous to walk! Fear of road traffic injury is the key reason people give for not cycling and that parents give for limiting their children’s independence. In Waltham Forest 14% of children age 11 are overweight and over 23% are obese or overweight. Every hour you spend in a car makes you 6 percent more likely to be obese. Every kilometer you walk (about .6 of a mile) reduces it by almost 5 percent. So making active travel safer and easier means better physical health, fewer car journeys and less congestion, pollution & road danger. Within living memory, children & young people have lost the independence previous generations have enjoyed. Now we have a once in a lifetime opportunity to change this. Communities need streets free from non-essential motor traffic in order to thrive. We need safe streets where children can make friends, invent new games and learn to compromise with each other. By creating convivial streets we can help young people can develop independence, confidence and social awareness. ‘Mini Holland’ principles can contribute to creating a borough where young people can feel they have a stake in their own communities. 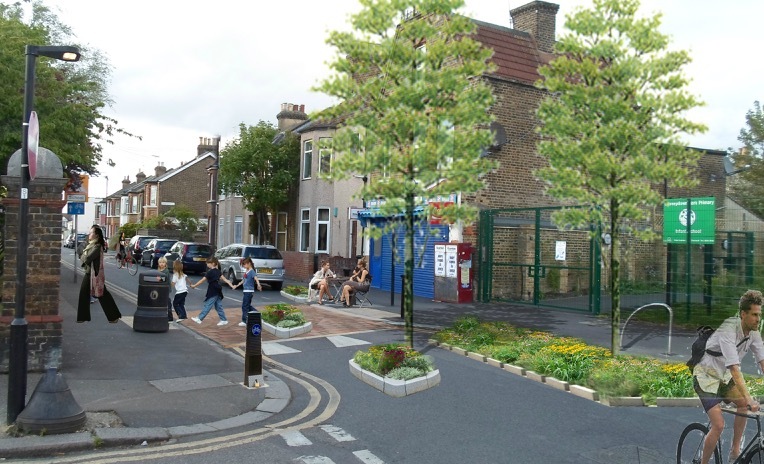 Through the Mini Holland programme our local authority is moving to create an environment where parents once again feel able to allow children their freedom. Empowering parents & young people to take ownership of their neighbourhoods can help to halt the decline in physical activity and informal social interaction. The current situation is severe, for example in Walthamstow’s High Street Ward, one quarter of 10 & 11 year olds are clinically obese (with 40% considered overweight by Public Health England )and more broadly there is evidence that mental health problems have doubled in young people over the past 30 years. As children grow many yearn to walk to school with friends instead of with fussing parents or carers, however far fewer are allowed that freedom today than just twenty years ago. Many parents & carers fear the consequences of allowing a child to cross even side roads alone and in some cases this leads to not being allowed out of the house at all. Such is the decline in informal street play on the pavements of the borough, that any child lucky enough to be allowed out in front of their home may well find their street deserted, there’s no one to play with any more. In particular the Mini Holland ‘Village’ schemes are taking significant steps towards reversing the decline in childhood freedom. With bold measures like those seen in Walthamstow Village, our streets can once again be places where children, young people and the vulnerable come first.